This page provides a current view of Amanita species and their distribution in the Great Smoky Mountains National Park (GSMNP) based on monographic literature and from unpublished data of R. E. Tulloss. 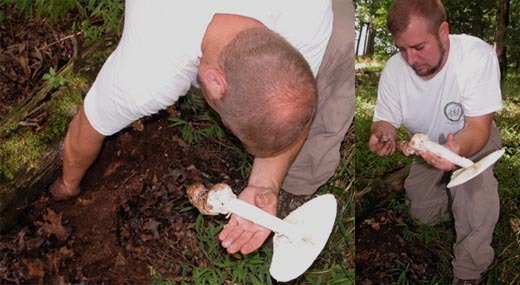 If this document is browsed while on-line, the "Amanita Studies" link (above) and entries marked "[ page ]" in the text will provide access to brief descriptions of the relevant taxa and, in some cases, access to full taxonomic descriptions. For the purposes of this study, we have confirmed 63 taxa in Amanita and 1 in Limacella known definitively to occur in GSMNP based on monographic literature, Hesler's Notebooks and photographs, the University of Tennesee herbarium (TENN), and Tulloss' unpublished data including data from the 1999-2006 collecting years of the GSMNP fungal All-Taxa Biodiversity Inventory (ATBI) project. The names of confirmed taxa listed for the Park prior to the Fungal TWIG work in the ATBI appear in the list in black bold italic type. Names new to the list since the beginning of the Fungal TWIG work in the ATBI, appear in red bold italic type. At present, 34 names on the list are in this category. These names are included in the count of confirmed taxa. Names that are based on probably correct field IDs appear in green bold italic type. At present 7 names on the list are in this latter category; these are not included in the count of "confirmed" taxa. Of the taxa that have been confirmed for the Park, it is worth noticing that 22 (over one third of the confirmed taxa) have not been described or are known under a misapplied or provisional name and will require validation or description as new. Such taxa are marked in this document with a bold face, white asterisk (*). In addition, two of the green bold italic taxa bear the white asterisk. At least 110 taxa of the Amanitaceae are known to be present or are possibly or probably present (including taxa known from surrounding areas in, or close to, the Appalachian Mountains in Kentucky, North and South Carolina, Tennessee, and West Virginia); and surely there is more than one taxon belonging to Limacella in the park. Based on my 30+ years of collecting in the northeastern U.S., several trips to eastern Texas and the Gulf Coast, 5 trips for collecting in central Mexico (which shares several taxa with the Smokies), and one collecting trip in the Cordillera Talamanca (Costa Rica) as well as review of large numbers of collections by others ranging southward to the Quercus forests of Andean Colombia, I believe it is reasonable to assume that future lists will include as many as 200 confirmed taxa of the Amanitaceae in the Park. RET's 2004 and 2006 collecting in the Park were largely supported by the Biology Department of the University of Tennessee, Knoxville, based on a National Science Foundation grant. I express my gratitude to Drs. Karen Hughes and Ronald H. Petersen for their support and for their inclusion of me in the process. "Ed Lickey gets the whole thing," starring Ed & Amanita daucipes. Photos by Dr. D. J. Lodge. Manipulation with Photoshop by RET. Vouchers: In the following lists of species, each element known from the park is followed by a list of the sites in GSMNP from which that element is known. Lists of herbaria in which vouchers from a given site have been reviewed or are known to exist are provided in square brackets. Each herbarium abbreviation is followed by one or more references in parentheses. (See the "Literature Cited" section at end of this list.) When collecting numbers are known, they are provided after the square brackets. When definitive determinations of such collections are available, an ATBI collection number or other collection number will be added to the information for the relevant name in bold face type. For many of Hesler's collections there are diagnosable photographs in TENN. Question marks before a locality name indicate uncertainty of diagnosis of the collection, not of the locality. Spore data has been added for many species. If the amount of data is very limited for a given species, it is derived from the literature. The format for RET's spore data is explained here. Collected within the last few decades in Kentucky (photograph). Cap probably is significantly paler when expanded (original description says it is white -- a term used for a wide range of pallid coloration in the 19th C. literature. TENN records not revised by Jenkins or a later author are probably assignable to one of the taxa of section Amidella. Spores per type study of JE77: 9 - 12.5 × 5.5 - 8 µm, (Q = 1.40 - 1.90; Q' = 1.62) Spores from single Kentucky specimen [RET]: [20/1/1] 8.5 - 11 (-14.8) x (5.5-) 6.0 - 7.2 (-7.5) µm, (L = 10.5 µm; L’ = 10.5 µm; W = 6.6 µm; W’ = 6.6 µm; Q = (1.40-) 1.42 - 1.77 (-2.28); Q = 1.59; Q’ = 1.59). Known in association with Tsuga and Abies as far north as central Québec and the Island of Newfoundland. The central Appalachians are the southern limit of the known range. Spores: [121/6/6] (7.3-) 7.7 - 9.5 (-11.6) × 6.6 - 8.4 (-9.4) µm, (L = 8.1 - 9.0 µm; L’ = 8.7 µm; W = 7.1 - 8.1 µm; W’ = 7.6 µm; Q = (1.0-) 1.04 - 1.23 (-1.32); Q = 1.10 - 1.16; Q’ = 1.14). Known in association with Quercus from southern Québec to the Cordillera Talamanca of Costa Rica. Spores: [160/8/8] (6.0-) 6.5 - 8.8 (-10.5) × (5.2-) 5.5 - 7.0 (-9.0) µm, (L = (6.8-) 7.1 - 8.0 µm; L’ = 7.4 µm; W = 5.8 - 6.4 (-6.5) µm; W’ = 6.1 µm; Q = (1.03-) 1.08 - 1.38 (-1.47); Q = 1.15 - 1.27 (-1.31); Q’ = 1.22). Cades Cove, Picnic Area [RET (u.d. ), TENN] H-?? Central Appalachians are the known southern limit of its range. The northern limit is in Québec. Spores: [199/10/6] (7.5-) 8.5 - 10.5 (-12.5) × (7.5-) 7.8 - 9.8 (-11.3) µm, (L = (8.5-) 9.0 - 9.6 µm; L’ = 9.2 µm; W = (8.1-) 8.5 - 9.2 µm; W’ = 8.7 µm; Q = 1.0 - 1.12 (-1.17); Q = (1.04-) 1.05 - 1.08; Q’ = 1.06). The epithet "gemmata" applies to a Eurasian taxon that is apparently not present in N. America. Amanita russuloides (Peck) Sacc. & other spp. fall within Jenkins' rather broad concept of A. gemmata. The latter name has been applied to other taxa in the Americas including A. xylinivolva Tulloss, Overbo & Halling and A. aprica J. Lindgr. & Tulloss, and several still undescribed species. At present, the appearance of this name in checklists is not useful for such things as biogeographical comparisons. The cap color of this species is unknown. No illustration of the species is known. 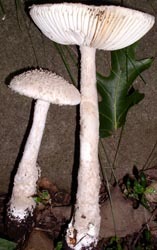 Jenkins stated that it was distinguished by the pointed warts on the cap and a felted patch of volva at the top of the basal bulb as well as by the size and shape of the spores. Originally described from South Carolina. Spores per type study of JE77: 9.8 - 11.2 × 7.0 - 8.0 (-9.0) µm, (Q = 1.19 - 1.50; Q' = 1.35). Range data for this species is not well established. It certainly exists as far north as southern Canada. Spores: [72/4/4] (6.6-) 7.0 - 11.2 (-15.0) × (5.2-) 5.6 - 8.4 (-8.7) µm, (L = 7.8 - 9.8 µm; L’ = 8.8 µm; W = 6.3 - 7.1 µm; W’ = 6.7 µm; Q = (1.05-) 1.12 - 1.50 (-1.58); Q = 1.22 - 1.39; Q’ = 1.31). Range for this species extends at least to central Quebec and the Island of Newfoundland. The author is uncertain of its southern limit. One of the causes of uncertainty is that the purple pigment in "red fly agarics" is rather quickly destroyed in sunlight. Hence, "yellow" or "orange" taxa are reported from regions in which var. guessowii does not exist. Spores: [120/6/6] (7.0-) 8.7 - 12.2 (-14.8) × (5.9-) 6.5 - 8.2 (-9.5) µm, (L = 9.2 - 11.4 µm; L’ = 10.5 µm; W = 7.1 - 7.8 µm; W’ = 7.5 µm; Q = (1.09-) 1.27 - 1.56 (-1.70); Q = 1.30 - 1.49; Q’ = 1.42). This taxon is distinguishable by the limited about of volval remnants on the stipe base, the median annulus, the stipe pigmentation (yellow above, white below), and somewhat narrower spores than in var. guessowii. It is generally considered a taxon of the SE USA, but has recently been found as far north as Long Island, New York and Sussex Co., NJ. A recent collection was displayed at the 2006 NAMA Regional Foray at Wildacres, North Carolina. Spores: [202/10/7] (8.0-) 9.2 - 12.0 (-15.8) × (5.5-) 6.4 - 8.3 (-11.1) µm, (L = 9.8 - 11.1 (-11.4) µm; L’ = 10.6 µm; W = 6.8 - 7.6 (-7.8) µm; W’ = 7.3 µm; Q = (1.19-) 1.33 - 1.61 (-1.75); Q = 1.43 - 1.50 (-1.52); Q’ = 1.46). Cades Cove [DTJ (JE77)] ! !TYPE LOCALITY!! This species is exannulate from the outset. From the top, this species (especially when lacking volval warts) can suggest A. jacksonii of Amanita sect. Vaginatae. The range of this species extends from New Jersey to the Gulf Coast. Spores: [87/5/4] (8.4-) 9.1 - 11.5 (-12.6) × (5.6-) 6.3 - 7.9 (-8.0) µm, (L = 9.9 - 10.9 µm; L’ = 10.4 µm; W = 6.7 - 7.3 µm; W’ = 7.0 µm; Q = (1.26-) 1.31 - 1.64 (-1.67); Q = 1.38 - 1.55; Q’ = 1.48). It has not been established that Coker's taxon is indeed the species described by Schweinitz. However, it appears to be a distinct taxon. Coker may have mixed some collections of his pubescens with exannulate collections of recutita sensu Coker (lower pair of images; see below). Notice the somewhat radicating bulb (to which Coker called attention) in the present taxon. Photographs are by W. C. Coker from (Coker, 1917). Spore measurements from Coker (1917): 9 - 14.4 × 5 - 7.2 µm. Estimated Q = . Note spore similarity to A. recutita sensu Coker. That species has a hollow stipe and a partial veil. Unique in Western Hemisphere amanitas in having a three layered volva comprising a membranous layer, a layer of pyramidal grayish warts, and a layer of pinkish or orangish pulverulence. The underside of the partial veil is pink or orange-white before fading. The range of this species extends from New Jersey to central Mexico. Spores: [60/3/3] (8.2-) 9.0 - 11.5 (-14.4) × (5.9-) 6.0 - 8.5 (-10.0) µm, (L = 9.7 - 10.4 µm; L' = 10.0 µm; W = 6.9 - 7.6 µm; W' = 7.2 µm; Q = ( 1.15-) 1.21 - 1.66 (-1.74); Q = 1.38 - 1.44; Q' = 1.40). Considered a species of the NE USA and SE Canada. Reliable, detailed range data, not known to the author. Spores: 7.9 - 13.2 × 6.3 - 7.9 µm; Q’ = 1.43. Known from north of the tree line in eastern Canada with Alnus and in a variety of heaths with dwarf Betula, dwarf Salix, Empetrum, and/or Vaccinium; elsewhere, associates may include Vaccinium (in cultivated blueberry fields), Betula, Populus, and (?)conifers. The central Appalachians is the known southern limit of this taxon's range. Note the degree of fading due to exposure to sunlight in the pilei depicted above. Spores: [395/19/14] (8.7-) 10.5 - 13.8 (-18.0) × (4.9-) 5.6 - 8.4 (-10.8) µm, (L = (10.6-) 11.5 - 13.0 (-13.2) µm; L’ = 12.0 µm; W = (5.3-) 6.7 - 7.6 (-8.6) µm; W’ = 7.1 µm; Q = (1.39-) 1.50 - 1.94 (-2.62); Q = (1.52-) 1.62 - 1.76 (-1.92); Q’ = 1.69). This is a new species, also known from similar habitat to that in which it is found in GSMNP (mixed forest including Tsuga) in New York, Pennsylvania, & Prov. Québec. Prior to the publication of Lamoureux's provisional name, RET knew the species as "Amanita sp. 32." On the Island of Newfoundland, the species occurs with conifers other than Tsuga. The name "A. gemmata" has undoubtedly been applied to this taxon. At present, the central Appalachians is the known southern limit of this taxon's range. Spores: [286/14/13] (6.3-) 7.3 - 9.8 (-12.6) × (5.6-) 7.0 - 9.1 (-11.9) µm, (L = (7.6-) 7.9 - 9.3 µm; L’ = 8.6 µm; W = (7.1-) 7.3 - 8.4 µm; W’ = 7.9 µm; Q = 1.0 - 1.17 (-1.42); Q = 1.05 - 1.10 (-1.11); Q’ = 1.08). A very small species associated with oaks and conifers. Spores: [60/3/3] (8.2-) 8.5 - 10.4 (-10.8) × (6.3-) 6.5 - 7.5 (-8.6) µm, (L = 9.0 - 9.7 µm; L’ = 9.4 µm; W = 6.9 - 7.0 µm; W’ = 7.0 µm; Q = (1.19-) 1.22 - 1.48 (-1.55); Q = 1.29 - 1.40; Q’ = 1.36). Originally collected in western South Carolina, this taxon is usually exannulate and may appear to belong in Amanita sect. Vaginatae before its stem's bulb is excavated. The species shares macroscopic characters with A. russuloides. In the future they may prove to be a single taxon. Spores: [100/5/5] (8.4-) 8.7 - 11.2 (-12.2) × (5.9-) 6.2 - 7.3 (-7.7) µm, (L = 9.3 - 10.7 µm; L’ = 9.9 µm; W = 6.5 - 6.8 µm; W’ = 6.7 µm; Q = (1.27-) 1.34 - 1.66 (-2.0); Q = 1.42 - 1.60; Q’ = 1.48). A "Slender Caesar group" amanita (Amanita stirps Hemibapha). Cap fulvous, striate; stipe white, possibly discoloring to fulvous below, with white annulus, with white saccate volva covering 1/3 to 1/2 of stipe. The species is known from the central Appalachians south to Florida and the Gulf Coast. Spores: [260/12/7] (7.0-) 7.7 - 11.4 (-15.0) x (5.6-) 6.0 - 8.0 (-10.2) µm, (L = 8.0 - 9.9 (-11.1) µm; L’ = 9.1 µm; W = (6.3-) 6.5 -7.4 µm; W’ = 6.9 µm; Q = (1.10-) 1.18 - 1.53 (-1.69); Q = 1.22 - 1.38 (-1.50); Q’ = 1.31). Known from Horse Cove, just outside park ca. Highlands, NC: H-22051. A "Slender Caesar group" amanita (Amanita stirps Hemibapha). Cap yellow at first, becoming brown-orange to brown from disc outward during expansion, with white volval sac rather small compared to other species of the stirps. Annulus is pale yellow and very similar to the color of the stipe and its decorations. Spores: [274/14/11] (7.5-) 8.4 - 11.9 (-15.0) × (5.2-) 5.9 - 7.8 (-9.8) µm, (L = 8.9 - 10.6 (-11.5) µm; L’ = 10.0 µm; W = 6.3 - 7.0 (-7.3) µm; W’ = 6.7 µm; Q = (1.14-) 1.33 - 1.71 (-2.14); Q = 1.39 - 1.61 (-1.69); Q’ = 1.49). Known in the central Appalachians from 2006 NAMA Regional Foray, at Wildacres, NC; however, no collection was retained. The range extends from the northern midwest USA throughout the NE states. The central Appalachians are as far south as the species is known to occur at present. Pileus whitish, sometimes Tilleul buff or Vinaceous buff over disc. Stipe annulate with saccate volva. Syntypes (when they can be located) will be from South Carolina and Florida. No illustration is known to RET. Spores: 11 - 14.5 × 5.5 - 7.5 µm, with Q' approx. 1.95. This species is not the European A. fulva. It is more closely related to A. fuligineodisca Tulloss, Ovrebo & Halling. Spores: [160/8/8] (8.0-) 9.2 - 12.0 (-14.0) × (6.8-) 8.8 - 11.2 (-12.5) µm, (L = (10.0-) 10.5 - 11.2 µm; L’ = 10.6 µm; W = (9.2-) 9.8 - 10.2 µm; W’ = 9.9 µm; Q = (1.0-) 1.02 - 1.14 (-1.22); Q = 1.06 - 1.09 (-1.10); Q’ = 1.08). This species, another member of Amanita stirps Hemibapha, occurs from southern Canada to the could forests of the Sierra Madre Orientale in Mexico. Spores: [317/15/11] (7.0-) 7.8 - 10.0 (-12.1) × (5.2-) 6.0 - 7.5 (-8.7) µm, (L = (8.1-) 8.4 - 9.5 µm; L’ = 8.8 µm; W = (6.0-) 6.3 - 7.3 µm; W’ = 6.7 µm; Q = (1.11-) 1.20 - 1.52 (-1.63); Q = 1.25 - 1.40 (-1.42); Q’ = 1.32). Another member of Amanita stirps Hemibapha, but lacking the bright colors of the other taxa in that stirps that appear in this list. The cap of this species is cream to whitish with a brownish center. Spores: [204/9/7] (8.5-) 9.5 - 12.6 (-13.6) × (5.6-) 6.4 - 8.4 (-9.2) µm, (L = 10.4 - 11.8 µm; L’ = 11.2 µm; W = 6.6 - 7.9 µm; W’ = 7.4 µm; Q = (1.23-) 1.32 - 1.74 (-1.88); Q = 1.43 - 1.58; Q’ = 1.51). This species is named for its olivaceous yellow cap (the color of Mandarin robes in imperial China. The submembranous volva becomes gray from the top down, often before the cap is fully expanded. Spores: [645/33/25] (8.0-) 9.1 - 12.1 (-15.4) × (7.0-) 8.4 - 11.5 (-15.4) µm, (L = (9.5-) 9.8 - 11.4 (-11.7) µm; L’ = 10.6 µm; W = (8.7-) 9.0 - 10.6 (-10.8) µm; W’ = 10.0 µm; Q = 1.0 - 1.14 (-1.26); Q = 1.04 - 1.09 (-1.10); Q’ = 1.06). This species is known for its graying annulus, its proportionally small volval sac, and it ellipsoid to elongate spores. The cap can be quite pale at first and develops pigment in the gray to brown range. Spores: [134/7/7] (7.7-) 9.4 - 13.1 (-15.5) × (5.2-) 5.9 - 7.8 (-9.0) µm, (L = 9.9 - 12.4 µm; L’ = 11.4 µm; W = 6.2 - 7.3 µm; W’ = 6.9 µm; Q = (1.40-) 1.48 - 1.83 (-2.04); Q = 1.60 - 1.76; Q’ = 1.65). There are so many taxa that could fall under this heading that it will probably end up in a list of "uninterpretable" names. The name in the strictest sense is a taxon probably limited to Europe; however, application of the name by European authors is not consistent. Material not yet examined in detail. The taxon is a European one and not to be expected in the US. See A. sp. S3 as one taxon that might have been included herein. Spores from North American material: [47/3/3] (8.8-) 9.0 - 11.0 (-13.0) × (7.5-) 8.0 - 10.0 (-10.3) µm, (L = 9.6 - 10.4 µm; L' = 9.9 µm; W = 8.6 - 9.2 µm; W' = 8.9 µm; Q = (1.0-) 1.05 - 1.22 (-1.27); Q = 1.10 - 1.12; Q' = 1.11). Spores (from European specimens): [100/4/4] (8.6-) 9.8 - 12.8 (-17.0) × (7.0-) 8.5 - 12.0 (-13.5) µm, (L = 10.8 - 11.9 µm; L’ = 11.4 µm; W = 9.5 - 11.0 µm; W’ = 10.3 µm; Q = (1.02-) 1.04 - 1.22 (-1.82); Q = 1.08 - 1.14; Q’ = 1.11). This small, brown, annulate species is so short that it may remain after a lawn is mowed. It is largely associated with mature (even very old) oaks. Spores: [940/47/18] (9.1-) 11.5 - 15.0 (-20.5) × (6.5-) 8.5 - 11.2 (-15.5) µm, (L = (11.7-) 12.3 - 14.0 (-14.1) µm; L’ = 13.2 µm; W = (9.1-) 9.2 - 10.5 (-10.9) µm; W’ = 9.9 µm; Q = (1.07-) 1.16 - 1.52 (-1.89); Q = (1.16-) 1.21 - 1.42 (-1.55); Q’ = 1.33). ?Heintooga Rd. & Rough Fork Tr., Polls Gap [RET (u.d.)] FU-0646. Zonate pileus (3 or 4 zones alternating cream to tan with olivaceous, with white margin (during expansion?). Stipe white and exannulate. Volva saccate and white. Currently known in northeastern USA as far south as West Virginia. Spores: [40/2/2] 8.0 - 10.1 × 7.7 - 9.8 µm, (L = 9.1 - 9.3 µm; L’ = 9.2 µm; W = 8.7 - 9.0 µm; W’ = 8.9 µm; Q = 1.0 - 1.08 (-1.11); Q = 1.03 - 1.04; Q’ = 1.04). Possibly the same as Amanita sp. NFL2. WIth apparent range extending from Isl. of Newfoundland, Canada, to GSMNP (North Carolina). Pileus whitish to cream with pinkish or orangish tints, umbonate, with marginal striae taking up about 1/3 of radius. Stipe exannulate and having similar tints. Volva saccate and white. Spores from Maine: [20/1/1] 9.2 - 11.0 (-11.5) × (8.2-) 8.5 - 9.5 µm, (L = 10.1 µm; W = 9.0; Q = (1.02-) 1.06 - 1.20 (-1.22); Q = 1.12). N.B. This first set of measured spores (from Maine) came from an aging basidiophore; the size ranges are probably shifted lower than normal. Spores from GSMNP: [33/1/1] (9.8-) 10.0 - 11.5 (-12.8) × 8.8 - 10.4 (-12.1) µm, (L = 10.7 µm; W = 9.7 µm; Q = (1.04-) 1.05 - 1.14 (-1.23); Q = 1.10). Pale gray cap, exannulate stipe, very narrow spores (Q=1.71). Pileus dark gray over disc, pale gray elsewhere, relatively short marginal striations, with very thick floccose-felted warts confluent; stipe exannulate with gray surface layer breaking up into dark fibrils from handling; volva originally saccate, but some breaking up into patches & becoming gray to dark gray. Having some similarity to RET's species N28. Spores: ?? Small species with very dark gray cap, striate, without volval remnants, but sometimes with distinct whitish pruinosity or frosty appearance; stipe white, exannulate, & finely pulverulent; volva saccate, white, sometimes staining paling orange. Small fruiting body with exannulate stipe & white saccate volva. Pileus is olivaceous gray becoming brownish gray with age, with paler zone btwn. disc & marginal striations. The single specimen has 25 mm wide pileus. (A) Pileus up to 90 mm wide, olive brown near margin, becoming more saturated toward disc, blackish brown to fuscous black over disc, planar when expanded, umbonate, with striate sulcate margin. Lamellae white. Stipe whitish to near "Tilleul Buff," powdery on upper half, with tawny olive fibrils on lower half, exannulate, about 150 × 12.5 mm, stuffed, with saccate volva having dingy inner surface. Spores: [20/1/1] (9.6-) 10.0 - 12.4 (-14.5) × (8.4-) 8.8 - 10.6 (-12.8) µm, (L = 11.0 µm; W = 9.6 µm; Q = (1.04-) 1.07 - 1.23; Q = 1.14). (B) Second specimen similar [See species S6], with powdery region on upper stipe distinctly grayish. Spores: (9.0-) 9.2 - 11.6 (-13.2) × (8.0-) 8.2 - 10.0 (-11.2) µm, (L = 10.1 µm; W = 9.0 µm; Q = 1.08 - 1.14 (1.22); Q = 1.12). The pileus is zonate, with disc and area over marginal striations dark brown to fuligineous at maturity and with a brown intermediate zone. The region of the marginal striations may be quite pallid at first. The stipe is exannulate, often bearing dark fibrils and may turn entirely gray in age. The volva is saccate with a limbus internus placed well above the sac's point of attachment to the stipe. The height of the limbus internus is about 20% - 25% of the distance from its point of connection to the volval limb to the highest point of the sac. Spores: [20/1/1] 12.3 - 14.5 (-15.5) × (11.1-) 11.7 - 13.1 (-13.7) µm, (L = 13.4 µm; L’ = 13.4 µm; W = 12.3 µm; W’ = 12.3 µm; Q = 1.04 - 1.13 (-1.19); Q = 1.09; Q’ = 1.09). =albosorora Tulloss nom. prov. Rather small fruiting body with exannulate stipe and white cupulate volva. Internal limb of volva & (sometimes) part of external limb separated from cupulate volva by strangulate zone. Pileus is white to off-white to cream with marginal striae and bears small patches or warts of volva concolorous with those on the stipe base. Spores: [20/1/1] (8.4-) 9.1 - 10.5 (-11.5) × (7.7-) 8.4 - 9.4 (-10.5) µm, (L = 9.8 µm; W = 9.1 µm; Q = 1.03 - 1.17; Q = 1.08). Pileus 78 mm wide, brownish gray with brown disc, virgate for most of radius, subplanar, umbonate, tacky; context white with a thin grayish line under pileipellis (lens), 4.5 mm thick at stipe, thinning evenly for 0.8 radius, then a membrane to margin; margin striate (0.5R), nonappendiculate; universal veil absent. Lamellae free, without decurrent line on stipe apex, close(? ), off-white in mass and in side view, 4.5 - 5.5 mm wide, with fimbriate margin (lens); lamellulae truncate to subattenuate to subtruncate. Stipe 140 × 9 mm (with stipe base inserted up to 80 mm in substrate), pallid, decorated with a pale gray pulverulence in upper 30 mm, with darker gray fibrils below, with membranous gray narrow patches in lower half, cylindric, flaring at apex, very fragile; context pale grayish white, not changing when cut or bruised, stuffed with white cottony material that bruises ochraceous, with central cylinder 3 mm wide; exannulate; universal veil as flimsy saccate volva, submembranous and crumbling especially in upper half of limbs, 30 mm from base to highest point on limb, up to 17 mm wide, gray in upper half, white in lower half, collapsing. Known from Blue Valley, Macon Co., North Carolina. Spores: [20/1/1] (9.1-) 9.5 - 10.8 (-11.0) × (8.0-) 8.5 - 10.0 (-10.5) µm, (L = 10.1 µm; W = 9.2 µm; Q = 1.05 - 1.16 (-1.19); Q = 1.11). Pileus 88 mm wide, yellowish-brown with olivaceous tint to the brown, campanulate to planoconvex, dry, dull; context white, unchanging when cut or bruised, 7 mm thick at stipe, thinning evenly to margin; margin striate (0.15 - 0.2R), nonappendiculate; universal veil absent. Lamellae free, without decurrent line on stipe, crowded, sordid tan in mass, sordid pale tan in side view, unchanging when cut or bruised, 5 mm thick; lamellulae truncate. Stipe 215 × 14 mm, whitish, narrowing upward, surface fibrillose and longitudinally striate; context whitish, apparently unchanging when cut or bruised, stuffed with white cottony material, with 6 mm wide central cylinder; exannulate; universal veil as a saccate volva, white, leathery and rather tough, 39 mm from base to highest point of limb. Known from Roper Mtn. Park, Greenville Co., South Carolina. Spores: [40/1/1] (9.0-) 9.2 - 12.5 (-15.5) × (6.5-) 6.8 - 9.2 (-11.8) µm, (L = 10.1 µm; W = 7.9 µm; Q = (1.06-) 1.08 - 1.60 (-1.86); Q = 1.26). =borealisorora Tulloss nom. prov. The stipe is exannulate with a "snakeskin" patter of brownish gray fibrillose scales on a pallid ground color. Near the base is a strangulate zone with graying whole or partial ring(s) above and/or below it. The volval remnants at the stipe base are cupulate. The cap is is gray brown or browner, often darkest over disc. The volval remnants on the cap are white at first but quickly become friable and dark gray. Spores: [80/4/4] (7.7-) 9.4 - 12.0 (-14.2) × (7.0-) 8.8 - 11.2 (-13.5) µm, (L = 10.0 - 11.0 µm; L’ = 10.5 µm; W = 9.3 - 10.5 µm; W’ = 10.0 µm; Q = (1.0-) 1.02 - 1.11 (-1.12); Q = 1.04 - 1.07; Q’ = 1.06). The range of this taxon probably extends into southern Canada. Basidiophores annulate at first, with bruising and staining reactions relatively faint. Spores: [1995/96/77] (7.1-) 9.7 - 15.0 (-26.6) × (3.4-) 4.2 - 6.8 (-9.2) µm, (L = (9.4-) 10.3 - 14.3 (-15.0) µm; L’ = 12.4 µm; W = (4.2-) 4.4 - 6.4 (-6.7) µm; W’ = 5.4 µm; Q = (1.33-) 1.73 - 3.05 (-4.51); Q = (1.73-) 1.86 - 2.93 (-3.08); Q’ = 2.29). Spores: [978/47/32] (7.0-) 8.8 - 12.5 (-24.0) × (4.0-) 4.9 - 6.2 (-10.0) µm, (L = (8.9-) 9.4 - 11.5 (-13.5) µm; L’ = 10.5 µm; W = (4.8-) 5.2 - 5.8 (-5.9) µm; W’ = 5.5 µm; Q = (1.36-) 1.59 - 2.30 (-3.33); Q = (1.64-) 1.70 - 2.12 (-2.26); Q’ = 1.91). Spores: [1223/61/45] (5.8-) 8.4 - 12.3 (-14.2) × (4.5-) 5.2 - 7.2 (-9.0) µm, (L = (8.6-) 9.0 - 11.8 (-12.4) µm; L’ = 10.3 µm; W = (5.1-) 5.5 - 6.8 (-7.6) µm; W’ = 6.2 µm; Q = (1.16-) 1.35 - 1.94 (-2.45); Q = (1.39-) 1.48 - 1.93 (-2.02); Q’ = 1.65). Spores: [1317/65/54] (5.0-) 8.0 - 11.0 (-13.5) × (3.8-) 4.5 - 6.0 (-7.8) µm, (L = (7.6-) 8.5 - 10.6 (-11.0) µm; L’ = 9.6 µm; W = (4.5-) 4.8 - 5.9 (-6.5) µm; W’ = 5.2 µm; Q = (1.11-) 1.52 - 2.16 (-2.76); Q = (1.42-) 1.64 - 2.04 (-2.14); Q’ = 1.85). Spores: [1070/52/43] (7.0-) 8.8 - 12.0 (-14.1) × (4.2-) 4.8 - 6.5 (-8.2) µm, (L = (8.4-) 9.0 - 11.2 (-11.6) µm; L’ = 10.3 µm; W = (4.7-) 5.0 - 6.1 (-6.8) µm; W’ = 5.5 µm; Q = (1.28-) 1.54 - 2.19 (-2.69); Q = (1.61-) 1.66 - 2.04 (-2.13); Q’ = 1.87). Basidiophores annulate at first. Spores: [230/7/6] (8.1-) 9.9 - 16.2 (-21.0) × (3.8-) 4.0 - 6.2 (-7.8) µm, (L = 11.1 - 15.2 µm; L’ = 13.0 µm; W = 4.2 - 5.9 µm; W’ = 5.2 µm; Q = (1.64-) 2.0 - 3.04 (-3.33); Q = 2.30 - 2.88; Q’ = 2.49). Spores: [97/4/4] (6.1-) 7.2 - 9.0 (-10.7) × (4.8-) 5.9 - 7.5 (-9.2) µm, (L = 7.9 - 8.5 µm; L’ = 8.1 µm; W = 6.1 - 6.8 µm; W’ = 6.6 µm; Q = (1.07-) 1.10 - 1.40 (-1.61); Q = 1.17 - 1.32; Q’ = 1.23). Note that the universal veil becomes brown and that warts of the u.v. can ring the stipe's basal bulb in its entirety. The partial veil can be lost or, if it persists, will become slimy and yellowish with age. The range of this species extends from southern Quebec at least to the Carolinas. Spores: [50/2/2] (8.0-) 8.7 - 10.5 (-13.0) × 5.9 - 7.7 (-8.5) µm, (L = 9.3 - 9.7 µm; L’ = 9.5 µm; W = 6.6 - 6.9 µm; W’ = 6.7 µm; Q = (1.18-) 1.25 - 1.64 (-1.67); Q = 1.41; Q’ = 1.41). The range of this species extends from the Pine-Oak barrens of Long Island (NY) and New Jersey to the Gulf Coast. 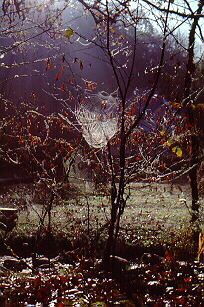 The partial veil is weakly attached; the stipe is often decorated with pale salmon to golden orange to pale orangish white fibrils especially after handling. Spores: Spores: [125/6/5] (6.5-) 7.5 - 10.8 (-12.0) × (4.5-) 4.8 - 6.0 (-6.8) µm, (L = 8.3 - 9.5 µm; L’ = 8.9 µm; W = 5.0 - 5.7 µm; W’ = 5.3 µm; Q = (1.35-) 1.46 - 1.94 (-2.16); Q = 1.60 - 1.75; Q’ = 1.67). Characteristic of this species are the very disorganized microstructure of the universal veil, the presence of plentiful large clamps at the bases of basidia, the persistently white or whitish color of the basidiophore, and the size and shape of the spores. The closest phenetic relative is A. tephrea. Spores: [85/4/4] (7.5-) 8.0 - 11.0 (-12.2) × (4.5-) 4.7 - 6.5 (-7.5) µm, (L = 8.5 - 10.2 µm; L’ = 9.2 µm; W = 5.1 - 6.1 µm; W’ = 5.5 µm; Q = (1.37-) 1.45 - 2.02 (-2.35); Q = 1.52 - 1.81; Q’ = 1.69). RET has doubts about the taxonomic value of this taxon. From experience with 7-17-06-A, material determined under the present name may simply be material of the type variety exhibiting the "yellowing syndrome." The irregular warts on the pileus sometimes give the impression of mudpies made by elven hands that have left their fingerprints in their product. Their is often the odor of newly made biscuit dough in fresh material. The top of the bulb tends to crack in such a way as to suggest a wall of concrete block. A small specimen might be taken for an extremely large specimen of A. onusta. Spores: [150/6/6] (8.0-) 8.8 - 12.0 (-14.1) × (4.9-) 5.2 - 7.0 (-8.3) µm, (L = 9.5 - 10.9 µm; L’ = 10.2 µm; W = 5.6 - 6.1 µm; W’ = 6.0 µm; Q = (1.30-) 1.50 - 2.0 (-2.40); Q = 1.63 - 1.82; Q’ = 1.72). Compare with A. sp. 5. Spores: [95/5/4] (9.2-) 10.8 - 13.2 (-15.0) × (5.5-) 6.5 - 8.7 (-9.5) µm, (L = 11.4 - 12.7 µm; L’ = 11.9 µm; W = (6.9-) 7.8 - 8.1 µm; W’ = 7.8 µm; Q = (1.27-) 1.35 - 1.79 (-2.0); Q = 1.44 - 1.56 (-1.74); Q’ = 1.53). Spores: [100/5/5] (8.0-) 9.1 - 11.5 (-13.8) × (5.3-) 5.5 - 7.2 (-9.9) µm, (L = 9.8 - 10.8 µm; L’ = 10.2 µm; W = 6.0 - 6.5 µm; W’ = 6.2 µm; Q = (1.22-) 1.48 - 1.82 (-1.93); Q = 1.57 - 1.68; Q’ = 1.64). Cades Cove, Hyatt Lane [TENN (u.d.)] DJL-TN-82. Lacking a pileipellis, volva arising from the pileus context and comprising chains of elongate cells in addition to hyphae. Spores: [260/12/7] (8.5-) 9.5 - 12.5 (-16.1) × (4.8-) 5.1 - 6.5 (-7.8) µm, (L = (10.0-) 10.4 - 11.1 µm; L’ = 10.7 µm; W = (5.4-) 5.5 - 6.1 µm; W’ = 5.9 µm; Q = (1.50-) 1.60 - 2.18 (-2.70); Q = 1.71 - 1.95 (-2.08); Q’ = 1.84). This species was originally described from pine-oak barrens of the coastal plain on Long Island, NY and in southern NJ. It's range extends through the appalachians to AL. Spores: [820/41/41] (7.2-) 9.8 - 14.0 (-21) × (3.9-) 4.6 - 6.3 (-9.8) µm, (L = (10.3-) 10.4 - 12.7 (-13.6) µm; L’ = 11.8 µm; W = (4.5-) 4.8 - 5.9 (-6.3) µm; W’ = 5.4 µm; Q = (1.50-) 1.75 - 2.63 (-3.50); Q = (1.85-) 1.94 - 2.48 (-2.51); Q’ = 2.20). Cades Cove [DTJ (JE81)] ! !TYPE LOCALITY!! The range of this species extends at least from southern New England to South Carolina. Spores: [55/3/3] (8.2-) 8.4 - 10.8 × (5.6-) 5.9 - 7.3 (-8.0) µm, (L = 9.3 - 9.9 µm; L’ = 9.5 µm; W = 6.2 - 7.0 µm; W’ = 6.6 µm; Q = (1.22-) 1.27 - 1.60 (-1.86); Q = 1.36 - 1.51; Q’ = 1.45. A very large specimen might be mistaken for a small specimen of A. cinereopannosa. Spores: [215/12/12] (7.0-) 8.0 - 11.0 (-13.0) × (5.0-) 5.5 - 7.0 (-8.3) µm, (L = 8.3 - 10.5 (-11.0) µm; L’ = 9.4 µm; W = 5.7 - 6.5 (-7.1) µm; W’ = 6.1 µm; Q = (1.14-) 1.28 - 1.85 (-2.21); Q = 1.35 - 1.65 (-1.84); Q’ = 1.52). The range of this species extends from the southern Catskill Mtns. in New York state to the Gulf Coast; it is known from North Carolina. This is the only known species of Amanita north of the Mexican deserts that has a blue-green tint or stain. In this case, it appears to be the volva that has this odd pigmentation. The gills are cafe-au-lait color as in A. microlepis. Spores: [125/5/3] (8.8-) 9.8 - 13.6 (-15.0) × (5.5-) 6.0 - 9.1 (-10.1) µm, (L = 10.6 - 12.1 µm; L’ = 11.5 µm; W = 6.5 - 8.1 µm; W’ = 7.2 µm; Q = (1.21-) 1.1.38 - 1.85 (-2.22); Q = 1.49 - 1.76; Q’ = 1.61). Large white mushroom with a solid stipe. Extremely distinctive in the field and rather quickly recognized by a collector once it is known to her/him. Pileus thick, covered with small pyramidal warts. Top half of bulb bearing many rings of small white warts. Spores: [285/13/11] (7.0-) 9.1 - 13.0 (-17.5) × (5.2-) 5.9 - 7.7 (-9.5) µm, (L = (9.0-) 10.0 - 12.1 µm; L’ = 11.4 µm; W = 6.5 - 7.2 (-7.4) µm; W’ = 6.8 µm; Q = (1.11-) 1.38 - 1.93 (-2.02); Q = (1.35-) 1.50 - 1.81; Q’ = 1.67). The volva forms a membranous limb on the top of the stipe's basal bulb. Compare with A. roanokensis. Spores: [85/3/3] (8.7-) 9.4 - 12.3 (-16.4) × (3.5-) 3.8 - 4.9 (-5.2) µm, (L = 10.7 - 11.7 µm; L’ = 11.2 µm; W = 4.2 - 4.6 µm; W’ = 4.3 µm; Q = (1.87-) 2.06 - 2.93 (-3.15); Q = 2.49 - 2.80; Q’ = 2.57). Because of the strong vertical orientation of the elements of the universal veil, the sides of the warts on the pileus of this species have the appearance of eroded hillsides (vertically striate). The shape of the bulb is very variable and can be very irregular in form. Compare to A. rhopalopus. Spores: [285/13/11] (7.0-) 8.0 - 11.9 (14.0) × (4.6-) 5.2 - 7.7 (-8.5) µm, (L = (8.3-) 8.5 - 11.1 µm; L’ = 9.7; W = 5.6 - 7.0 (-7.4) µm; W’ = 6.3 µm; Q = (1.23-) 1.33 - 1.81 (-2.50); Q = 1.46 - 1.64 (-1.81); Q’ = 1.54). The universal veil is disorganized in comparison to that of A. ravenelii and, hence, in warts, the eroded appearance of the sides is not seen in the present species. The stipe and bulb are often "dog-legged." Spores: [110/5/5] (7.3-) 8.0 - 10.9 (-12.5) × (4.8-) 5.4 - 6.8 (-8.1) µm, (L = 8.6 - 10.0 µm; L’ = 9.2 µm; W = 5.9 - 6.4 µm; W’ = 6.1 µm; Q = (1.19-) 1.32 - 1.745 (-1.88); Q = 1.46 - 1.61; Q’ = 1.52). Cades Cove [L, MICH, TENN (BAS69)] ! !PARATYPE from this site!! H-12852, H-22132 p.p. Differs from the type form in having a top-shaped basal bulb on the stipe. The taxonomic value of this distinction is worthy of review. The volva forms a short, membranous limb on the bulb. Range from North Carolina to the Gulf Coast. The species is largely reported (to date) from the coastal plain. Compare with A. praelongispora. Spores: [40/2/2] (12.0-) 12.8 - 17.1 (-19.5) × 3.6 - 4.9 (-5.0) µm, (L = 14.4 - 14.7 µm; L’ = 14.6 µm; W = 4.1 - 4.4 µm; W’ = 4.2 µm; Q = (2.62-) 2.73 - 4.08 (-4.67); Q = 3.32 - 3.70; Q’ = 3.51). Gills distinctively yellow-cream from early development. Universal veil on pileus from cake-like warts to pulverulence (sometimes on a single specimen). Gills often forking. Occasionally exhibits yellowing syndrome. Laccase+ in base of radicating bulb. Range from Cape Cod, Massachusetts to Florida and Gulf Coast. Spores: [596/27/27] (7.3-) 9.1 - 14.0 (-21) × (3.5-) 4.2 - 5.2 (-6.5) µm, (L = (8.9-) 9.6 - 12.7 (-13.6) µm; L’ = 11.4 µm; W = (4.1-) 4.3 - 5.1 µm; W’ = 4.6 µm; Q = (1.57-) 2.0 - 3.0 (-3.83); Q = (2.03-) 2.21 - 2.79 (-2.81); Q’ = 2.47). Known from South Carolina to New Jersey and Long Island, New York. A taxon phenetically closely related to to A. chlorinosma. White at first, then pale beige, and finally pale grayish. Rather small and gracile in material found in recent years. Formerly also known as "species S2" in RET's keys, notes, correspondence, etc. (=A. subcokeri Tulloss nom. prov.) Having large rooting bulb with recurved scales, occasionally having “doubled” partial veil (see photo, above left), odorous (burnt sugar mixed with cedar chest), acquiring brick red spots, warts unusually liable to attack by Penicillium spp., spores proportionately too narrow for A. cokeri. Spores: [461/23/23] (8.0-) 10.2 - 14.0 (-19.0) × (5.2-) 5.9 - 7.5 (-10.9) µm, (L = (10.7-) 10.8 - 13.6 (-13.8) µm; L’ = 12.1 µm; W = (6.0-) 6.1 - 7.0 µm; W’ = 6.6 µm; Q = (1.33-) 1.57 - 2.17 (-2.82); Q = (1.59-) 1.64 - 2.02 (-2.11); Q’ = 1.85). Usually with an extremely long radicating basal bulb that is extremely difficult to excavate. The specimen on the left, above, is an exception. The cap of this species bears a notable sterile margin extending a few mm beyond the outer ends of the lamellae. Spores: [250/12/12] (6.5-) 8.4 - 11.7 (-14.7) × (4.3-) 4.5 - 6.3 (-7.8) µm, (L = (8.7-) 9.1 - 11.0 µm; L’ = 10.1 µm; W = 4.9 - 6.1 (-6.2) µm; W’ = 5.4 µm; Q = (1.43-) 1.57 - 2.18 (-2.89); Q = 1.69 - 1.97 (-2.17); Q’ = 1.86). KOH+. Tyrosinase-. Odorless at first, sickeningly sweet in age. Spores: [452/19/16] (5.2-) 7.2 - 9.9 (-11.0) × (4.8-) 6.5 - 8.6 (-10.0) µm, (L = (7.8-) 7.9 - 9.2 (-9.6) µm; L’ = 8.4 µm; W = (7.0-) 7.1 - 8.1 (-8.2) µm; W’ = 7.5 µm; Q = (1.0-) 1.02 - 1.25 (-1.70); Q = (1.05-) 1.06 - 1.18 (-1.20); Q’ = 1.11). KOH-. Tyrosinase+. Having ample, superior, membranous partial veil. Odor was not mentioned in unfortunately brief protologue; however, collections consistent with the type have odors described as "dirty socks," "old ham," or "something like phalloides, but with addition of "chlorine." The gills can be pinkish in mass in some lights. Very similar to A. sp. S4. Originally described from Chapel Hill, North Carolina, with range extending north to at least West Virginia and probably further, possibly occurring as far south as the Gulf Coast and eastern Texas. Spores from holotype: [110/4/4] (8.0-) 8.7 - 11.2 (-11.5) × (5.8-) 5.9 - 7.5 (-7.8) µm, (L = 9.6 - 9.9 µm; L' = 9.8 µm; W = 6.5 - 6.9 µm; W' = 6.8 µm; Q = (1.25-) 1.29 - 1.60 (-1.71); Q = 1.40 - 1.50; Q' = 1.45). Odor of "chloride of lime." Originally described from North Carolina. Spores from holotype: (8.4-) 8.9 - 11.8 (-12.4) × 6.0 - 8.0 (-8.7) µm, with Q = 1.46 - 1.54. Originally described from North Carolina, (additionally known several times from outside the park in the same state). Lamellae described as pink and becoming more intensely pigmented with age. Could this taxon be based on some water-soaked, small material of A. elliptosperma? Spores: ?? Paratype from NC outside of park. Stipe's bulb is long and narrow; volva is saccate and attached only near base of elongated bulb. Spores: [200/9/6] (9.4-) 10.5 - 13.3 (-14.8) × (4.2-) 5.0 - 6.3 (-7.2) µm, (L = 11.4 - 12.3 (-12.6) µm; L’ = 11.8 µm; W = (5.4-) 5.6 - 5.9 µm; W’ = 5.7 µm; Q = (1.56-) 1.79 - 2.31 (-3.05); Q = 1.99 - 2.19 (-2.28); Q’ = 2.08). Usually KOH-. Some specimens exihibit a yellowing reaction to cutting or bruising (yellowing syndrome?) and these may be KOH+ (Y. Lamoureux, pers. corresp.). An off-white species with a thick and felted, rather than thin and membranous, partial veil. Known mostly from New York, Wisconsin, and southeastern Canada. Spores [160/8/5] (7.2-) 8.2 - 10.8 (-12.5) × (5.2-) 5.8 - 7.8 (-9.2) µm, (L = 8.7 - 9.9 µm; L' = 9.5 µm; W = 6.0 - 7.1 µm; W' = 6.6 µm; Q = (1.15-) 1.27 - 1.62 (-1.72); Q = 1.38 - 1.49; Q' = 1.43). KOH-. Tyrosinase+. Odor of chlorine or "chloride of lime." White species with thin and membranous partial veil. Gills sometimes pinkish (see sectioned button on left above). Known from West Virginia to Texas. Very similar to A. elliptosperma. Spores: [165/7/5] (7.3-) 8.4 - 11.2 (-13.5) × (4.9-) 5.5 - 6.8 (-8.5) µm, (L = 9.0 - 9.7 (-10.3) µm; L' = 9.6 µm; W = 5.9 - 6.3 µm; W' = 6.0 µm; Q = (1.30-) 1.41 - 1.83 (-2.0); Q = 1.50 - 1.60 (-1.69); Q' = 1.58). Collectors have reported the buttons of this species are black or midnight blue. Tulloss has never seen a button. The species belongs in a small group of the Phalloideae with pigmented caps that do not have the pigments organized in the pointilliste manner of A. phalloides. Spores: [85/4/4] (8.0-) 8.5 - 13.5 (-15.5) × (5.0-) 5.2 - 6.5 (-8.5) µm, (L = 9.1 - 12.1 µm; L' = 10.6 µm; W = 5.6 - 6.5 µm; Q = (1.40-) 1.52 - 2.09 (-2.42); Q = 1.54 - 1.89; Q' = 1.78). Truly white except for disc. Very much slower to stain than A. brunnescens. Spores: [200/9/6] (5.8-) 7.0 - 9.5 (-10.9) × (5.0-) 6.8 - 8.8 (-10.5) µm, (L = (7.6-) 7.9 - 8.6 µm; L’ = 8.4 µm; W = (7.2-) 7.5 - 8.0 µm; W’ = 7.8 µm; Q = (1.0-) 1.02 - 1.14 (-1.20); Q = 106 - 1.08 (-1.09); Q’ = 1.07). The northern limit of distribution of this species is presently GSMNP. The southern limit is in the Quercus forests of Andean Colombia. The species has been found relatively frequently in the Cordillera Talamanca of Costa Rica. Reports from Mexico have not been confirmed. Spores (including from isotype and paratypes): [258/10/6] (6.5-) 7.5 - 10.0 (-12.5) × (5.0-) 5.8 - 7.8 (-9.0) µm, (L = (8.3-) 8.4 - 9.4 µm; L’ = 8.8 µm; W = (6.1-) 6.3 - 7.0 µm; W’ = 6.7 µm; Q = (1.05-) 1.17 - 1.47 (-1.69); Q = 1.27 - 1.34 (-1.36); Q’ = 1.31). First record for the USA found during 2006 NAMA Regional Foray at Wildacres, North Carolina. RET 9-29-06-B & 9-30-06-A, duplicate of latter in F?, L?, NY?, & TENN.
Spores: [35/2/2] (7.0-) 7.5 - 9.2 (-9.5) × (6.5-) 7.0 - 8.5 (-9.2) µm, (L = 8.2 - 8.7 µm; L’ = µm; W = 7.6 - 8.0 µm; W’ = µm; Q = (1.0-) 1.03 - 1.15 (-1.18); Q = 1.08; Q’ = 1.08). There is a name for this entity, but unfortunately it is unusable. The current combination (as a variety of A. brunnescens) is not taxonomically supportable, and the epithet in question (straminea) is not available at species rank in Amanita. RET has completed a type study for this taxon. It still must be compared with A. citrina f. lavendula (below). Spores: [100/4/4] (6.0-) 7.5 - 9.0 (-11.0) × (5.8-) 6.8 - 8.5 (-10.2) µm, (L = 8.0 - 8.6 µm; L’ = 8.3 µm; W = 7.6 - 8.2 µm; W’ = 7.8 µm; Q = (1.0-) 1.02 - 1.13 (-1.20); Q = 1.05 - 1.07; Q’ = 1.06). Dried material of this taxon can be distinguished from A. citrina sensu auct. amer. by its spores which are notably smaller. L' values differ by more than 1 µm based on data to date; and W' values differ by more than 1.5 µm. In fresh material, f.lavendula is often smaller and paler colored, with a relatively narrower bulb and a partial veil that may turn lavender, but not gray as in the similar taxon. The lavender coloring of volva, cap, and stipe, and lavender staining of context may be dependent on environmental factors such as windchill [or temperature] near or below freezing on a recent, previous night. The photograph on the right is courtesy of Mr. Cornelis Hobenbirk (NJ). Spores: [55/3/3] (6.3-) 6.4 - 8.0 (-8.8) × (5.2-) 5.5 - 7.1 (-7.8) µm, (L = 7.0 - 7.2 µm; L’ = 7.1 µm; W = 6.0 - 6.4 µm; W’ = 6.2 µm; Q = (1.03-) 1.05 - 1.26 (-1.30); Q = 1.11 - 1.18; Q’ = 1.15). Apparently close to A. flavoconia, from which it is distinguished by pigmentation and spore shape (having narrower spores). The stipe of the present entity is dominantly (if not entirely) white. The cap is usually dominantly or entirely yellow (with some exceptions that suggest the possibility of intergrading with A. flavoconia. The range of A. elongata extends from the Island of Newfoundland, Canada in the north to the GSMNP, southwestern South Carolina, and, possibly, further south. If A. elongata and A. flavoconia are to be placed at the rank of variety within a common species, the name having priority for the species is A. flavoconia. Spores: [133/7/7] (6.8-) 7.5 - 10.5 (-12.5) × (4.0-) 5.0 - 6.9 (-8.7) µm, (L = 7.9 - 9.6 µm; L’ = 8.7 µm; W = 5.3 - 6.4 µm; W’ = 5.8 µm; Q = (1.21-) 1.33 - 1.70 (-1.81); Q = 1.45 - 1.58; Q’ = 1.51). Uneven pileus, detersile warts, brown disk, robust stipe, fragile partial veil. Known range extends from New Jersey to North Carolina. Spores: [40/2/2] (7.0-) 7.3 - 9.8 (-11.5) × (4.5-) 4.9 - 6.2 (-6.5) µm, (L = 7.8 - 8.8 µm; L’ = 8.3 µm; W = 5.0 - 5.7 µm; W’ = 5.4 µm; Q = (1.31-) 1.40 - 1.69 (-1.92); Q = 1.54 - 1.56; Q’ = 1.55). Spores: [139/8/8] (6.5-) 6.8 - 9.0 (-10.6) × (4.8-) 5.0 - 7.0 (-8.9) µm, (L = 7.2 - 8.2 (-8.6) µm; L’ = 7.9 µm; W = (5.3-) 5.5 - 6.9 µm; W’ = 6.0 µm; Q = (1.08-) 1.15 - 1.50 (-1.64); Q = 1.21 - 1.43 (-1.49); Q’ = 1.33). This species is one of the few taxa known to extend down the east coast of N. America and into central Mexico and also to appear in the limited extension of the western Madrean ecosystem in SE Arizona. Spores: [180/9/8] (7.4-) 7.8 - 11.0 (-12.6) × (4.9-) 5.4 - 7.0 (-8.4) µm, (L = 8.3 - 9.7 (-10.7) µm; L’ = 9.2 µm; W = (5.5-) 5.7 - 6.6 µm; W’ = 6.1 µm; Q = (1.17-) 1.28 - 1.76 (-1.96); Q = (1.34-) 1.37 - 1.67; Q’ = 1.52). This is the common "rubescens" of eastern Canada and the eastern US. It is distinct from the European species. Liable to attack by Hypomyces hyalinus. This entry includes specimens with yellowish underside of the partial veil which do not represent A. rubescens f. annulosulfurea of Europe. Spores: [40/2/2] (7.0-) 7.3 - 9.5 (-9.8) × (5.6-) 5.9 - 7.0 (-7.3) µm, (L = 7.9 - 9.1 µm; L’ = 8.5 µm; W = 6.4 - 6.6 µm; W’ = 6.5 µm; Q = (1.05-) 1.14 - 1.46 (-1.53); Q = 1.23 - 1.38; Q’ = 1.31). Originally described from North Carolina. Known range extends from NE USA at least to SW South Carolina. Some specimens (see photograph) have a yellowish underside to the partial veil. Spores: [141/7/6] (6.5-) 7.0 - 9.8 (-10.5) × (4.5-) 5.0 - 7.0 (-8.5) µm, (L = 7.6 - 9.0 (-9.2) µm; L’ = 8.3 µm; W = 5.5 - 6.1 (-6.7) µm; W’ = 5.9 µm; Q = (1.12-) 1.24 - 1.60 (-1.69); Q = 1.34 - 1.49 (-1.50); Q’ = 1.41). The range of this taxon as known at present extends from eastern Illinois to Connecticut, then southward to the Appalachian foothills in western S. Carolina. Stipe bruising salmon then becoming sordid; spores: [144/6/5] (5.9-) 7.0 - 9.2 (-10.5) × (4.2-) 4.5 - 6.0 (-6.5) µm, (L = (7.7-) 7.8 - 8.4 µm; L’ = 8.1 µm; W = (4.9-) 5.2 - 5.6 µm; W’ = 5.3 µm; Q = (1.18-) 1.35 - 1.75 (-1.88); Q = 1.45 - 1.57 (-1.62); Q’ = 1.54). This species was originally described from Nova Scotia. Spores: [70/3/3] 7.0 - 8.8 (-10.5) × (5.5-) 6.5 - 8.0 (-9.5) µm, (L = 7.9 - 8.2 µm; L’ = 8.0 µm; W = 7.1 - 7.4 µm; W’ = 7.2 µm; Q = (1.0-) 1.03 - 1.27 (-1.35); Q = 1.06 - 1.16; Q’ = 1.11). Amanita spissa var. alba Coker non Rick etc. This species has slipped out of the literature for decades and is only just being recognized again. It can be recognized by its gray-brown cap, its grayish and friable volva, its large white partial veil (like a broad, hooped skirt), and its odor (frequently of fruit or anise or both). Its currently known range is from the northern tier states of the eastern USA to the Carolinas, but i probably extends to both the north and south. Brown pileus; differing from sp. 36 due to apparent innate fibrils in pileus, paler yellow volva, & a more olivaceous brown pileus; differing from European franchetii at least in lack of yellow exposed context when the immature pileipellis is scraped away; habit suggestive of flavoconia; liable to attack by Hypomyces hyalinus. Spores: [45/2/2] 7.0 - 9.1 (-9.4) × (4.9-) 5.2 - 6.3 µm, (L = 7.8 - 8.5 µm; L’ = 8.3 µm; W = 5.5 - 5.8 µm; W’ = 5.7 µm; Q = (1.25-) 1.30 - 1.62; Q = 1.42 - 1.47; Q’ = 1.45). Possible from outside of park ca. Gatlinburg - H-25630. This is not the European taxon. If the pileipellis is scraped once the cap has begun to emerge, the color seen is always yellow. Limacella kauffmanii H. V. Sm. [BAS69] Bas, C. 1969. Morphology and subdivision of Amanita and a monograph of its section Lepidella. Persoonia 5: 285-579. [JE77] Jenkins, D. T. 1977. A Taxonomic and Nomenclatural Study of the Genus Amanita Section Amanita for North America. Biblioth. Micol. 57: 1-126. [JE81] Jenkins, D. T. 1981. A new species of Amanita. Mycotaxon 13: 112-114. [HVS45] Smith, H. V. 1945 ["1944"]. The genus Limacella in North America. Pap. Michigan Acad. Sci. 30: 125-147, pl. I. Created with the assistance of Lindsay Possiel 2004, 2005, and 2006. Photographs ("Ed Lickey gets the whole thing") copyright 2006 by D. J. Lodge.